Eyetracking Web Usability is based on one of the largest studies of eyetracking usability in existence. 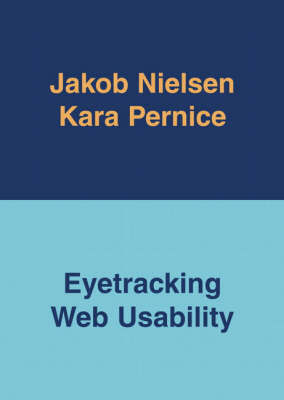 Best-selling author Jakob Nielsen and coauthor Kara Pernice used rigorous usability methodology and eyetracking technology to analyze 1.5 million instances where users look at Web sites to understand how the human eyes interact with design. Their findings will help designers, software developers, writers, editors, product managers, and advertisers understand what people see or don't see, when they look, and why. With their comprehensive three-year study, the authors confirmed many known Web design conventions and the book provides additional insights on those standards. They also discovered important new user behaviors that are revealed here for the first time. Using compelling eye gaze plots and heat maps, Nielsen and Pernice guide the reader through hundreds of examples of eye movements, demonstrating why some designs work and others don't. They also provide valuable advice for page layout, navigation menus, site elements, image selection, and advertising. This book is essential reading for anyone who is serious about doing business on the Web.